The AcuteBand Pre-stained Protein Ladder is a three-color protein standard with 10 pre-stained proteins covering a range of molecular weights from 6.5 to 270 kDa. It is designed for monitoring protein separation during SDS-PAGE and verifying Western transfer eﬃciency on membranes and for approximating the size of proteins. 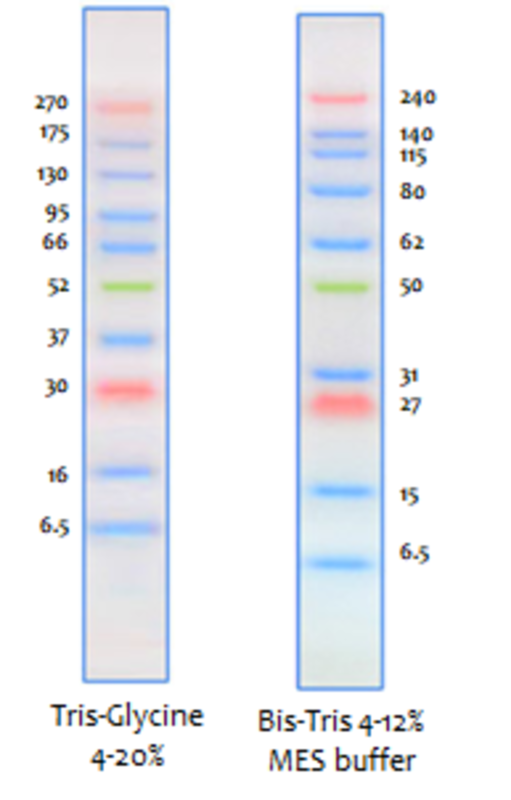 The AcuteBand Pre-stained Protein Ladder is also ideal for Western Blotting by the LICOR System. 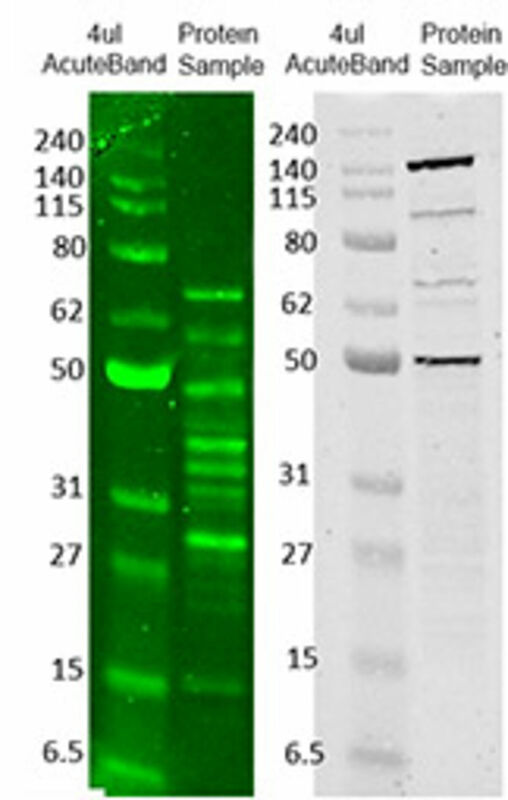 All markers are bound by the secondary antibody and the bands are clearly visible. No need to mark the bands with a pencil, no need for any additional treatment before the secondary antibody! Performance data on LICOR. 4uL AcuteBand ladder loaded. 200V 20min resp. 100V 90min in Bis-Tris gel. Goat anti-rabbit 800nm secondary. YesBlot Western Marker I is a ready-to-use mixture with ten IgG-binding proteins covering a wide range of molecular weights from 15 to 200 kDa in TrisGlycine buffer. It contains 4 pre-stained proteins (10, 25, 45 and 70 kDa) for monitoring protein separation during SDS-PAGE, verification of Western transfer efficiency on membranes (nitrocellulose, PVDF, or nylon) and for approximating the protein size. Second, ten IgGbinding proteins can be immuno-detected on film or by CCD imaging. YesBlot™ Western Marker I is compatible with chemiluminescent, fluorescent, chromogenic or other detection systems.